Looking for a great piece of jewelry to show off your dark side? Perhaps you just love the looks of black jewelry. Not only is black one of the hottest colors for rings – but tungsten is one of the hottest trends in jewelry. 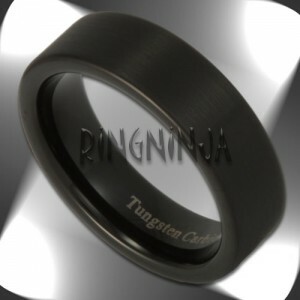 Over at Ring Ninja they have some stunning solid black tungsten rings. These rings come in multiple widths. You can get the rings in either 3MM (great for a woman, or if you’re just looking for that thing band), 6MM wide, 8MM wide, 10MM wide, and even 12MM wide. All of these black tungsten rings are a pipe cut (also known as flat) style, and have a matte finish. The matte finish really allows the ring to stay dark, and not be dark a shiny at the same time. This is a ring in such a timeless, dark style, it would even make the late great Johnny Cash smile as he slid it onto his finger. In addition to being great looking rings – they can also be engraved. A lot of companies offer different engraving services, but Ring Ninja can engrave your ring on the inside, AND it can be engraved on the outside. The contrast on having a black ring engraved is very impressive! There are quite a few different fonts to choose from, and if you contact their customer service department they will also let you know if they can do a custom font that you are looking for. For the boldest look, we had a ring engraved in their Desdemona font (all in capital letters) and it turned out wonderfully! Also after seeing some of their samples of custom Elfish engraving (all of your lord of the rings fans, this applies to you) and their different Chinese and Japanese engravings – we were really impressed with the value! Here is our 8MM Black Pipe Cut Matte Finish Tungsten Wedding Ring. This ring features a matte (also known as brushed or satin) finish, with a black IPG plating. This is one good looking ring. Be sure to consider inside or outside engraving on this ring for a nice high contrast engraving. This 8MM Black Pipe Cut Tungsten Wedding Ring is a popular choice for a wedding band, but can certainly be worn as a great piece of jewelry. This entry was posted on Monday, July 29th, 2013 at 8:34 pm. You can follow any responses to this entry through the RSS 2.0 feed. You can leave a response, or trackback from your own site.